The Beauty Cave: WHAT I GOT FOR CHRISTMAS 2013 + MINI HAUL! I know I'm very late on this whole 'what I got for Christmas' post, but better late than never! I'm really not trying to brag in anyway! I was so lucky this year and am grateful for everything. Let us begin...Firstly one of my main presents which isn't featured on this picture for obvious reasons is that I'm getting my bedroom redone! My bedroom is getting quite tacky and is just in need of a huge makeover, therefore I can't wait to have it all decked out in fairy lights and floral duvets and far too many pillows. I might do a room tour or a diy room decor post, because scrolling through my pinterest makes me want to become a diy goddess and fill my room with cute cork pin boards and all that cute stuff. I'm also going to be going on a shopping trip and buying way to many clothes and things I really don't need *cough* jumpers *cough*. 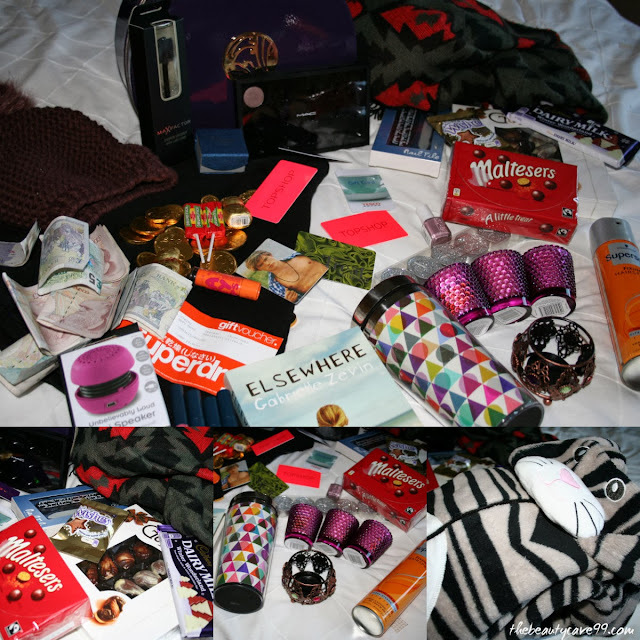 This year I got loads of little things which were totally unexpected. Unlike most years where I send out a 10 page list of things I would like, I didn't have a clue what I wanted so all of these things were such a lovely surprise! The only thing I did ask for was a new onesie (with a hood, without the feet and an animal to be precise), and my Grandma and Grandad kindly got me a cat one! It's literally the softest thing ever, and although its massive (Primark needs to sort out its sizing! ), its perfect for lounging around in! They also got me four mini Yankee Candles (one I'm currently burning) in Vanilla frosting in these purple 'bubbly' candle holders. They smell amazing and I've been burning one all afternoon and it's fair to say I'm addicted. I also got a mini speaker in my stocking which is great because its wireless and all you have to do is charge it and then you can plug it into your phone/iPod anywhere and voila! Loud, beautiful music! HOW COULD I FORGET MY MAC PRO PALETTE? I cannot wait to start filling it up, so far I only have Mac's Satin Taupe but next on my list are Cranberry and Woodwink! I see so many pretty pictures of peoples palettes all filled up and they look gorgeous, so now I've got my own to fill mwhah! I also have had a slight obsession with beanies (I love slogan ones! ), and I received this purple one with a fuzzy bobble on the top, from my Auntie and Uncle and cousins along with a voucher! It looks lovely on and keeps me really snug and warm. I have added it to my 'always growing' collection. Those were just a few things I received but now I'm going to move onto the mini haul. I brought the most chunky, warmest scarf possible from H&M with a gorgeous aztec print on (around £14/15). It keeps me soo warm and cosy and it literally makes me fall asleep because its like having a pillow all the way around your neck! I also brought this quilted skater skirt from H&M (£12.99), I tried it on and it's looks amazing. It's not that type of skater skirt which just 'hangs' on your body, this really goes 'out' and looks really flattering. It's also got quilted which adds a little bit more texture to your look and also keeps you a lot warmer. That was all I've brought in the last week, but I wanted to show you! Due to the fact that I'm going on a two big shopping trips in this upcoming week, and wanted to keep that haul separate (if I get anything!). Happy New Year, I hope you all had a wonderful new years eve and have started your 2014 well and have kept to your resolutions so far! I am going to try and make 2014 a big year for my blog, I have so many exciting posts coming up/planned and am really going to be working hard in achieving my blog goals! It's the last few days of the holidays *cries*, I am now mentally preparing myself for that 7am alarm. I can't even think about it. I still haven't finished all my art coursework, and have a stupid amount to do therefore any spare moment I have I will be sat with my art book finishing off everything. Anyway, I have wrote far too much in this post and if you've read all of this then I applaud you!